This article is about the video game Doom. For other uses of the term Doom, please see Doom (disambiguation). Doom is a first-person shooter (FPS) computer game developed by id Software and released in 1993. With its innovative use of 3D graphics and visceral gameplay, Doom changed standards for interactive entertainment and came to define the emerging FPS genre for years after its release. Distributed as shareware at a time when the number of people with access to the Internet was growing explosively, it changed social aspects of computer gaming by popularizing multiplayer deathmatch (a game where the aim is simply to kill as many other players as possible) and by enabling players to create and share custom-built modifications to the game. The player takes the role of an unnamed marine who is working for the Union Aerospace Corporation (UAC) on Mars. The UAC is a multi-planetary corporation that deals with the disposal of radioactive waste including that created by the military. For years the military has been using the UAC's facilities on Mars' two moons, Phobos and Deimos, to conduct experiments on inter-dimensional space travel. This has involved the creation of gateways which act as portals — things going into one gateway come out of the other. Recently the gateways have been unstable. Anyone entering them either disappears or suffers a violent death. Officially this is a small set-back, and everything is under control. Just prior to the game commencing, Mars received a garbled distress call from the Phobos facility saying that "something fraggin' evil is coming out of the Gateways!" Soon after, Deimos vanished from the sky. The player and his team are sent to Phobos to investigate. This backstory is provided solely in the game's manual. There is no introductory cutscene to the game itself, and instead the player finds themselves thrown straight into the action that is completely straightforward: "Pick up guns, shoot everything that moves, walk to the exit." The game is broken down into three episodes, each several levels long. Very little storytelling takes place within the levels themselves, but at the end of each episode a screen of text is displayed with an update on the story. The first episode, Knee-Deep in the Dead, takes place in the military installations on Phobos. At the end of the episode the player enters the gateway on Phobos, which leads to Mars' other moon Deimos. This is the setting of the second episode, Shores of Hell. After fighting through Deimos the player learns that the moon is now actually floating above Hell itself. The player climbs down to the surface of Hell, which is the setting for the third and final episode, Inferno. After the player defeats the final boss of the game the player discovers another gateway, this time leading back to Earth. An ending cutscene is played, in which the player learns that the demons have invaded Earth. The game ends here, a cliffhanger that leaves the story open for the second game in the series. Id Software did not have any definite plans for its next game after releasing Wolfenstein 3D in May 1992. While the designers put together an expansion for Wolfenstein 3D called Spear of Destiny, lead programmer John Carmack isolated himself to spearhead the development of a new game engine with support for more realistic three-dimensional worlds. He figured out the tricks needed to render diagonal walls, texture mapping of floors, and variable lighting. An early version of the engine was licensed to Raven Software for use in the game Shadowcaster. Id Software started building a game around Carmack's engine in September 1992. Designer Tom Hall wanted to make a new Commander Keen game; he was voted down since the rest of the team thought a darker game would do the engine better justice. Id Software then negotiated rights to make a game based on the science-fiction action film Aliens, but the plan was soon abandoned due to concerns of creative freedom. John Carmack instead came up with the idea "Aliens meets Evil Dead 2", or "demons versus technology". This theme also drew from the team's most recent Dungeons & Dragons campaign, which had ended with demons overrunning the entire planet. Carmack came up with the name Doom after watching the film The Color of Money, in which Tom Cruise's character replies "Doom" when asked what he carries in his cue-case. According to Carmack, "That, and the resulting carnage, was how I viewed us springing the game on the industry." 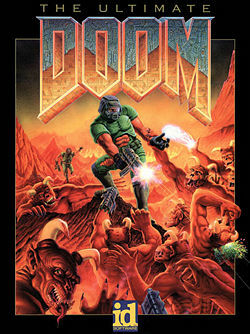 The first draft for the game's design was prepared by Tom Hall, who wrote a comprehensive design document called the Doom Bible. He envisioned gameplay wholly different from the simple-minded action of Wolfenstein 3D: an elaborate storyline, multiple player characters with different personalities and abilities, and interactive features such as in-game computer terminals. He began designing levels based on authentic military architecture, decorated with realistic-looking wallpapers, floor tiles, and office equipment. However, the rest of the id Software staff preferred the action-oriented style of Wolfenstein 3D and thought Hall's design emphasized realism at the cost of entertainment. The conflict ended with Tom Hall's resignation in the summer of 1993, and much of the Doom Bible was discarded. Doom obtained its characteristic, more abstract, level style when John Romero took up level design. He explored "large spaces with more complex sector geometry", used altitude changes abundantly, and made his levels "flow so the player will revisit areas several times [to] better understand the 3D space". He further created "easily recognizable landmarks in several places for easier navigation", made conscious use of contrast in lighting and proportion, and filled his levels with secret areas. Since Romero was both a programmer and a level designer, he only had time to design the game's first episode. Some ten weeks before release, Sandy Petersen was hired to help out, and in that time finished the last two episodes, incorporating Tom Hall's drafts. There are notable stylistic differences between Romero's and Petersen's levels. Romero's levels are generally considered more visually pleasing; others at id Software went so far as describing Petersen's levels as "downright ugly". David Kushner characterizes Petersen's design as "cerebral" and Romero's as "brutal". The game's sprites and textures were designed by Adrian Carmack and Kevin Cloud, who took inspiration from the biomechanical art of H. R. Giger, the mythos of H. P. Lovecraft, and creatures from Dungeons & Dragons (the Cacodemon is directly based on the front cover illustration of the 1987 edition Manual of the Planes). The artists found that it was difficult to manually draw sprites that would do justice to the new graphics engine. They therefore turned to blue screen capture to create several of the character graphics. Adrian Carmack created clay sculptures for the player character, the Cyberdemon, and the Baron of Hell; Gregor Punchatz was contracted to create the Spider Mastermind in latex. The sculptures were photographed from five to eight different angles so that they could be rotated in-game, and finally touched up, colored, and animated digitally. The shotgun and pistol graphics were created from photographs of toy weapons, while the chainsaw was created from photographs of a McCulloch Eager Beaver. Finally, Don Ivan Punchatz supplied the package art and logo design. Robert Prince, who had scored Wolfenstein 3D, was hired to supply the music and sound effects. He and Romero recorded original sounds that he mixed with various stock sound effects, a "puree of animal sounds" for the monsters. He then enhanced the sounds by doubletracking them with his own voice imitations, recorded in reverse. Prince created a MIDI soundtrack ranging in style from heavy metal to ambient "moody background music". Id Software first requested that Prince would compose nothing but heavy metal, but he thought that the style was not appropriate for all levels. As many players have noted, some of the tracks are uncredited covers of songs by heavy metal bands such as Metallica, Pantera, and Slayer. Prince has a law degree and, according to Romero, "knew the legal amount of sampling that he could do without getting into trouble". Screenshot of Doom in action. A common estimate is that 15 million people have played the shareware version of Doom. Doom became notorious for its popularity in workplaces and university computer labs. Id Software had hyped Doom as about to become "the number one cause of decreased productivity in businesses around the world". Indeed, Intel "banned the game after it found its systems swamped", as did many universities in the United States. At the University of Louisville, where "people [sprinted into the computer lab] falling all over each other to play the game", a lab supervisor created a program that would go through the system and delete all copies of Doom. At Lotus Development, players of the "fiercely fought Lotus League of Doom" were granted access to the network after 6 pm, although installing the game at all was officially disallowed. At the Microsoft campus, Doom was like a "religious phenomenon", by the account of one employee. 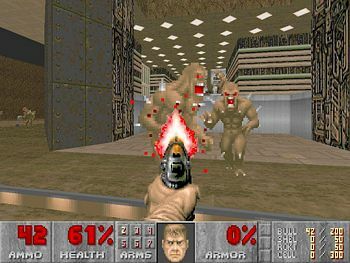 In 1999, Dennis Chao of the University of New Mexico modified Doom into a system administration tool, noting the game's "appeal to the target audience of system administrators". Immediately after the release of Doom, enthusiasts began working on tools to modify the game. On January 26, 1994, the first version of the Doom Editing Utility, a program created by Doom fans which made it possible to create entire new levels, was uploaded to the Internet, and many other editing programs followed. Carmack additionally released the source code for the utilities used to create the game, but these were programmed in Objective-C, for NeXT workstations, and were therefore not directly usable for most people, who were PC users. The Aliens TC, developed by Justin Fisher in 1994, based on the movie Aliens, was the first total conversion. In the week following the release of Doom II, there was more discussion in the Doom newsgroups related to Aliens TC than Doom II. The TC provided inspiration for the 1998 Dreamworks game Trespasser. Fisher was offered employment by various game developers (including Dreamworks for the team that would later make Trespasser), but declined in order to finish his university degree. The Aliens TC was noted for its suspenseful atmosphere. The first level is devoid of enemies, a surprising feature considering the fast-paced action of Doom. Later on, however, the player faces the aliens and even gets to use the powerloader from Aliens as a weapon. Fisher got the idea to create the Aliens TC within his first five minutes of playing Doom in late December 1993, noting a similarity in atmosphere of Doom and the movie. Even those WADs which transformed the game by replacing graphics and sounds were somewhat limited; much of the game's behaviour, including the timing and power of weapons and enemies, was hard-coded in the game engine and impossible to alter from WADs. One program called DeHackEd addressed this fact by letting users modify parameters inside the Doom executable itself. Around 1994 and 1995, WADs were distributed primarily through bulletin boards and via CD collections found in computer shops or bundled together with editing guide books. In later years Internet FTP servers became the primary method for obtaining WADs. Although the Doom software license required that no profit be made from custom WADs, such CD compilations could be sold as long as the price only covered distribution costs. Additionally, a handful of first-person shooter games released at the time used the Doom engine under a commercial license from id Software, as such essentially being custom WADs packaged with the Doom engine. An example is the 1997 release HacX. Doom immediately became the standard by which similar games were judged. The term "first-person shooter" did not gain popularity until the late 1990s; the years after Doom's release, first-person action games were generally known as "Doom clones". One of the most noted clones was Star Wars: Dark Forces, which Lucas Arts reputedly developed in response to the prevalence of Star Wars-themed Doom WADs. Id Software themselves capitalized on the success by developing a sequel, Doom II: Hell on Earth, as well as several commercial add-ons. They picked up some of the most talented WAD makers from the community to create official expansions that would compete with the unauthorized collection CDs. The team produced the 21 Master Levels, which on December 26 1995 were released on a CD along with Maximum Doom, a collection of 1,830 WADs that had been downloaded arbitrarily from the Internet. In 1996, Final Doom, a package of two 32-level sets created by TeamTNT, was released as an official id Software product. In 1995, a rumor spread that Doom was more widely distributed than Microsoft's extensively advertised new operating system Windows 95. Bill Gates, seemingly aware of this, asked in an internal e-mail whether he should buy out id Software. Though the plan was never realized, Microsoft did respond to the popularity of Doom by increasing their focus on gaming, particularly by developing the DirectX technology and a Doom port for DirectX as a flagship. To promote Windows 95, Gates made a presentation at a game developers' conference while digitally superimposed into Doom to blast zombies. In the words of Lev Grossman, Doom presented a "three-dimensional virtual world so powerful, compelling and disturbing that it would change the real world around it", whose "fluid, hyperkinetic rhythms [became] part of the visual language of movies and TV". As many players were unfamiliar with the type of interactive 3D graphics, Doom was sometimes half-jokingly said to be the source of "Doom-induced motion sickness" or DIMS. Doom was and remains notorious for its high levels of violence, gore, and satanic imagery, which have generated much controversy from a broad range of groups. It has been criticized numerous times by religious organizations for its diabolic undertones and was dubbed a "mass murder simulator" by critic and Killology Research Group founder David Grossman. Doom prompted fears that the then-emerging virtual reality technology could be used to simulate extremely realistic killing, and in 1994 led to unsuccessful attempts by Washington state senator Phil Talmadge to introduce compulsory licensing of VR use. The game again sparked controversy throughout a period of school shootings in the United States when it was found that Eric Harris and Dylan Klebold, who committed the Columbine High School massacre in 1999, were avid players of the game. A rumor spread afterwards that Harris had designed Doom levels that looked like the halls of the high school, populated with representations of Harris's classmates and teachers, and that Harris practiced for his role in the shootings by playing these levels over and over. However, although Harris did design Doom levels, they were not simulations of Columbine High School. According to John Romero, Doom was successful because it arrived at the right time and synthesized many emerging technologies, which id Software "just capitalized on". Critics have argued that Doom primarily owed its success to its graphics technology or its explicit graphical violence. Others have praised the game's design. Chris Crawford characterizes the design as "pedestrian ... there's nothing brilliant or innovative ... In design terms, Doom offers nothing that we didn't have in 1981. It is a collection of old and well-established ideas with really snazzy graphics. But the ideas are assembled with great skill. The designers of Doom implemented the basic precepts of good game design with impressive thoroughness." Greg Kasavin holds that Doom "achieved its blockbuster success solely through its incredibly high quality". Numerous publications have ranked Doom among the most influential games of all time. Doom received Game of the Year awards by both PC Gamer and Computer Gaming World in 1994. It also received the Award for Technical Excellence from PC Magazine, and the Best Action Adventure Game award by the Academy of Interactive Arts & Sciences. PC Gamer named it the most influential game of the decade in 2004, and second greatest PC game of all time in 2005. In 2001, Doom was voted the greatest game of all time in a poll among over 100 game developers and journalists conducted by GameSpy. Around 1997, interest in Doom WADs began to decline, as attention was drawn to newer games with more advanced graphics and yet more customizable design, including id Software's own Quake. Doom is the subject of several still-active websites. Its longevity can be attributed to the multitude of available WADs and editing tools. In early 2007, the idgames archive contained 15,000 modifications and received some dozen new submissions each week. Since the engine source code was released in 1997, over 50 source ports have been developed that allow Doom to be played on modern operating systems, provide extended editing features, and add new multiplayer game modes. The Compet-N archive contains 6072 speedruns for Doom and its sequels, which makes it the second most popular game for speedrunning after Quake. This page was last modified 12:04, 27 August 2013.